There are plenty of reasons why employees lie in certain circumstances. Having a negative thought or socially unacceptable idea tied to their name is a risk at work. They may lose their job, their boss may retaliate, or their peers may think less of them. It’s a common enough fear that a few executives who have evaluated Insight have asked the question: are survey responses anonymous? By default, our employee engagement survey is attributable: supervisors can view the individual responses given by their team members. However, we can make surveys anonymous and still provide actionable information for company leadership. It’s just not what we recommend. A big benefit of anonymous surveys is that there’s less perceived opportunity for retaliation for negative responses. However, a big detriment is that anonymity prevents leaders from truly understanding their people and making meaningful improvements. That said, our survey is also designed to avoid placing blame. A person’s perception of the company is simply their perception., and perceptions are something you can influence. Addressing the underlying concerns that explain why employees lie will help you solicit more honest feedback. Address these concerns and employees will see no need for anonymous surveys. They will gladly give you attributable feedback. When you send a survey, employees are going to assume you expect a certain result. That may be a positive rating of your performance as their leader, a certain outlook on how the company is doing, or a positive opinion on some other topic that you care deeply about. Employees are not necessarily trying to lie: they simply want you to get the result you want. By framing survey questions in an objective manner—where any response feels appropriate, neither good nor bad—you can avoid this phenomenon of well-meaning people saying what [they think] you want. If you dive into personally sensitive questions such as personal relationships, personal views, or finances, people tend to dodge the question. And with good reason: as their supervisor, these personal questions are none of your business. In fact, some questions in these areas can violate employment and anti-discrimination laws. While learning more about your employees as people is a good thing for building trust and rapport, it’s best done outside of a survey. You can accomplish your goal through other means, such as going to lunch together or taking a walk around the office. As an employer, if you really have an interest in the personal lives of your employees, you will need to (1) remain cognizant of the fact that you are an employer, not their friend, and (2) employees do not owe you answers about their lives outside of work. Generally, it’s best to avoid these types of sensitive questions altogether. Employees who are concerned about their standing in the workplace may repeat company lines: they will parrot ad nauseum the goals and values that have been spoken by company leadership. This can cause them to hide their own disagreement with aspects of your company culture. Alternatively, they may hesitate to speak up when they discover that the company is not living up to its stated values. This hesitancy makes for great survey responses and great engagement metrics but terrible feedback. To avoid this behavior, frame questions objectively and using fixed responses (Likert scales, multiple choice questions, etc.) wherever appropriate. Also, focus on questions that are actionable. A question like “Are our stated company values appropriate?” is not going to give you anything critical or actionable (no one chooses negative-sounding values, and no one will disagree that things like “honesty” and “teamwork” are good). However, a question like, “Can you recall an instance in the past two weeks where company leadership demonstrated our stated company values?” will let people describe their perception of company performance (they either had this experience in the past two weeks or not) while still giving you something actionable to work with (consider how to better demonstrate your values). Another reason why employees lie is if their true answer to a question is socially unacceptable. If they believe a widely accepted plan is not the best course of action, they will likely go along with the plan if everyone else does. People generally don’t enjoy being the sole voice of dissent, as it can hurt their professional credibility with their peers and company leadership. Once again, objectively framing questions and making fixed-choice responses will mitigate the risk of this occurring. In a similar vein, if your questions appear to have a right or wrong answer, employees will probably choose the “right” answer even if it isn’t truly what they believe. While an answer may be socially acceptable, it can still feel like the incorrect one. For instance, if you needed to agree or disagree with a statement like, “I receive adequate feedback on my work from my boss”—knowing full well your boss will read your response—you’re probably going to agree… even if you’ve never heard from your boss. Once again, let’s have objectivity come to the rescue! A better way to frame this question is, “Someone on my team provides adequate feedback on my work.” This does not directly call out any specific person’s performance but does identify whether or not there may be a problem. Seeking personal validation is another reason why employees lie. If someone is upset about past situations at work, they may respond to a survey in extremes in order to elicit a strong response to their concerns. This is typically due to past situations remaining unresolved. While their supervisor may feel a problem has been resolved, the employee may not. It may be a matter of no one explicitly acknowledging to the employee that there was a very real problem, the employee not receiving an apology from relevant parties, or the employee feeling they were unfairly treated in the days or weeks since the initial problem occurred. Whatever the cause, extreme answers can be a sign that your employees do not feel like you are listening. The best thing you can do is be present. Regularly check in with people, listen more than you speak, and follow up when there’s an action you can take to improve their work life. You can roll up many of the previously covered reasons why employees lie into a question of trust. If employees don’t know how you will respond to negative feedback or are afraid there may be some sort of personal retribution for non-ideal survey responses, they will not give you the honest feedback you seek. Fostering a relationship of mutual trust takes time. Therefore, you should start building relationships right away—long before you worry about sending another survey—so your people are more comfortable giving you critical feedback and know what to expect from you when you receive bad news. A specific consequence of an absence of trust is the fear of termination. No one wants to put their job on the line due to some survey. Therefore, if employees are unsure where they stand with you, they will give middle-of-the-road or pleasant responses to any serious questions. To mitigate the risk of a survey feeling like a trap, review your people regularly. This doesn’t have to be a formal process: so long as people know where they stand with you and have no fear of imminently losing their job, they will not worry about the consequences of a few critical survey responses. Oftentimes employees will say things that are untrue because they believe them to be true. Or, even if they don’t know a statement to be true, they may believe it sounds plausible. For example, they may assert that the company is doing poorly because they heard that Customer X (whom they’ve never met) is upset about another team’s work quality. They don’t know that Customer X is unhappy or that their coworkers did a bad job, but they may believe it. And if people repeat the rumor enough, employees will eventually accept the rumor as fact. The best you can do to combat this situation is counter rumors with indisputable facts, like hard metrics. If you don’t have all the facts but believe the rumor to be false, you can ask why the employee believes the rumor to be true. What evidence can they present to convince you that their assertion is correct? The worst thing you can do with survey responses is throw them away. If company leadership does not react to survey responses, employees will become conditioned to not care about them. If leaders don’t care enough to respond, why should employees complete the survey in the first place? In these instances, if responding to the survey is mandatory, employees will complete these seemingly useless surveys as quickly and thoughtlessly as possible. We recommend that you survey as frequently as you can respond to the feedback. If you can only react to employee feedback on an annual basis, well, you should only have one survey per year. If, however, you can improve things employees are concerned about on a monthly basis, you can issue a monthly survey. In other words, you’re only going to get out of a survey what you put in. If you demonstrate its importance to you, employees will see it as an important exercise. Insight helps leaders identify at-risk employees, highly engaged employees, and more. It also guides you in leadership development by outlining what actions managers can take with their direct reports to increase employee engagement. Our employee engagement survey is designed to assess what people care about and how they perceive the company. Objective survey items encourage honest feedback that drive leadership action. The benefits of employee engagement are numerous. However, so many people focus on discussing the qualitative outcomes of higher engagement: employees are more satisfied at work, they believe in the company’s mission statement, and so on. Those outcomes of engagement are important, and they have a demonstrable impact on individual performance. However, there are also many material benefits of employee engagement that are highly valuable to the company. Below are our top nine benefits of employee engagement. First and foremost, employee engagement efforts drive lower turnover and higher retention. According to the State of the American Workplace report, highly engaged teams can experience up to 59% less turnover than disengaged teams. The costs of replacing an employee are significant. Replacing an employee you failed to retain results in lost time and money. Increasing team engagement can prevent that cost, which can easily reach the five- or six-figure range once you account for lost opportunity, compensation deltas, recruiting, and training. When people are motivated, they become more effective at their jobs. They are driven, focused, and productive. The State of the American Workplace report shows a 17% increase in productivity for highly-engaged employees. You can also expect up to 21% higher profitability from high-engagement companies. The aforementioned productivity improvements and increased retention results in more sustainable and profitable growth. This profitability lends engaged companies to faster growth than disengaged companies. A Cornell University study found that companies which offer workplace autonomy—a key contributor to employee engagement—grow at four times the rate of control-oriented companies. This can be explained in part by our earlier mention of increased profitability as well as additional benefits outlined in the State of the American Workplace report, such as a 28% reduction in shrinkage and a 20% increase in sales. Engaged employees are more likely to recommend great people they know to join them at work. Employee referrals for job candidates is a top sourcing method for recruiters. A Jobvite study found that 40% of new hires are sourced by current employees. They also found that job candidates who are referred by current employees will move through the hiring process more quickly than other candidates. That makes sense: your highly engaged employees would only refer people they trust to do a great job, right? Employees want to feel good about the company they work for, especially their direct managers. Management is cited as one of the leading causes for employees to seek other employment, so increasing trust helps fuel the aforementioned benefit of employee engagement: decreased turnover and higher retention. Additionally, when your people trust you, they will offer you candid feedback you may not otherwise hear. If they realize that you are seeking the best ideas and best path forward for the team, they will give you their thoughts and advice on what should happen next. They may even give you a pass if you make a bad call every once in a while. This type of engagement makes for a more resilient company, as leadership considers the best ideas to solve the problems they face. A result of that increased trust is the introduction of more valuable ideas. Engaged employees are more likely to speak up when they have observations or ideas that may impact the performance or sustainability of the company. As a company leader, you seek to hire the best and the brightest for your team. Once you have them, demonstrating your receptiveness to their thoughts and ideas will create the positive reinforcement that may one day give you innovative and profitable ideas worth implementing across the company. When employees are highly engaged, they are less likely to leave your company for a new job. Engaged employees are more likely to feel that they have adequate compensation and desirable advancement opportunities within their current company. 83% of employees describe career advancement as either important or very important to them. However, only 54% of employees are satisfied with their opportunity for advancement with their current employer. By presenting advancement opportunities, your people will be more likely to remain with the company for significant parts of their career. When you are engaged at work, you are more likely to show up for work. Highly engaged companies experience a 41% reduction in absenteeism when compared to low-engagement companies. This worker reliability increases predictability of work, which is highly important for customer satisfaction when those employees are in customer-facing roles. Now that you’ve read about the top nine benefits of employee engagement, are you interested in learning how to better engage your employees? Create your free account for Insight and gain access to our leadership playbook. The playbook has dozens of ideas for motivating your team and increasing employee engagement. You can also send surveys to your team to measure their current level of engagement, and then receive personalized action plans that tell you how to support your employees based on what they need most. Should the Unemployment Rate Impact Your Employee Engagement Efforts? The US Bureau of Labor Statistics reports on the national unemployment rate on a monthly basis. We’re now seeing jobless rates in America that haven’t been this low in decades. But what does that mean for your employee engagement efforts? As an employer, should employee engagement have a higher or lower priority as the unemployment rate drops? The answer, naturally, depends on your industry and staffing needs. However, low unemployment equates to greater job mobility. Employers can’t fulfill positions as easily when everyone already has a job. If you’re not already running an employee engagement program at your company, focusing on employee engagement can set you apart in a crowded job market. Generally, a low unemployment rate means a need for greater competition among employers. Since most people are already employed, team growth requires attracting people from less desirable jobs into more desirable ones. While the overall job change rate has been declining in recent years [PDF], overall wage growth has also stagnated. Additionally, employees who stay in the same job for more than two years make significantly less than those who change jobs more frequently. While the general trends may give you a false sense of comfort regarding retention risks, the opposite can be true when positions require significant education or training. In high-growth industries with highly educated employees, such as technology and healthcare, this is a recipe for employee attrition. Additionally, the younger your employees, the more likely they are to change jobs. How can employers stand out in competitive industries? Focusing on employee engagement and company culture is the best way to stand out in a crowded employment market. Additionally, ensure that you are giving people the right opportunities and the right compensation to remain competitive in your industry. Increasing your employee engagement efforts is one way for your company to become more desirable in highly competitive job markets. Employee engagement is the level of emotional connection and commitment an employee has to your company. Highly engaged workers are 87% less likely to leave their companies[PDF] than disengaged workers. Previously, I’ve covered the importance of treating recruiting like a marketing program. A solid recruiting program should have the same rigor you would apply to any other external-facing effort. Consistent branding, language, and visuals are a good first step. Beyond that good first impression, your recruiting program will need clear and simple processes that give every job candidate a consistently great applicant experience. I’ve also described the importance of making job ads stand out from the crowd by stating your company’s purpose. Purpose-filled job ads are more likely to attract top talent, who generally want to be part of something bigger than themselves. Additionally, understanding a company’s purpose helps potential and existing employees frame their decisions in terms of what the company values most. Employees with high job mobility want to work at a company where they have the ability to advance professionally. Therefore, promoting from within is a powerful employee engagement and retention tool. As an employer, internal promotions are attractive because existing employees already understand the company culture and know what the job entails. As an employee, internal promotions are opportunities for greater compensation, a greater impact on fulfilling the company’s purpose, more professional development, and greater recognition. Dan Pink’s book on employee motivation, Drive, makes the case for focusing on higher-level motivators—Autonomy, Mastery, and Purpose—but prefaces that with a requirement to meet basic needs such as compensation. Pink’s recommendation is to take the issue of money off the table by compensating people well. In addition to competitive pay, research the full suite of benefits offered by other employers in your industry. Do you offer competitive—or superior—healthcare, retirement plans, and time off? Having a competitive compensation package will alleviate employees’ base concerns of survivability and sustainability, leaving them free to focus on higher-level concerns of job performance and engagement. Regardless of unemployment numbers or the current job market, the best time to start an employee engagement is now. The benefits of highly engaged employees are far-reaching, from an increase in team retention to a strongly-correlated increase in company revenue. Begin your employee engagement initiative by defining employee engagement. There are countless definitions floating around, so it’s important to define exactly what employee engagement means for your organization. Insight, our employee engagement platform, defines employee engagement as one’s emotional connection and commitment to their organization. Also ensure your leadership team understands common misconceptions about employee engagement. Review 12 common myths about employee engagement with your team to ensure no one conflates employee engagement with other concepts such as job satisfaction or performance. This alignment of goals and expectations for your employee engagement program is necessary to ensure everyone knows what to expect in return for their employee engagement efforts. Like any other effort in your organization, there should be one person designated as in charge. Selecting an appropriate employee engagement program manager is critical to the success of your nascent effort. You need a single person you can depend upon to facilitate higher levels of employee engagement. They need the authority to institute employee engagement metrics and leadership training programs they believe are necessary to make the program successful. Without a designated employee engagement program manager, your program will become an afterthought. Similarly, if your program manager is not allocated time to focus on employee engagement, you do not really have a program manager. You have a scapegoat. Remember that your program manager is an employee, too, and you need to ensure they have the resources they need to be successful (time, money, tools, people, etc.). When companies start their employee engagement journey, one of the most common mistakes they make is inconsistently measuring employee engagement. The most common method of measuring engagement is to issue a quarterly or annual employee engagement survey. If the questions on these surveys change every time, you will not be able to consistently measure engagement. The numbers will only be meaningful in isolation, and you won’t have a clue whether engagement is trending up or down in your organization. Spend time establishing the specific metrics you hope to track over time, and research the most appropriate questions to ask before issuing your first survey. Insight takes care of this for you, providing an employee engagement survey template that consistently measures your team’s level of employee engagement. This is not to say you can never add, remove, or change questions in your survey. However, it is important to recognize that even a simple change in wording can give you very different responses to a question. In addition to quantitative metrics, send your team some open-ended questions. No survey will capture everything that every employee cares about, so giving them a way to express their most valued opinions about work is important. Once you have consistent measurements in place, you can analyze the data for trends and ideas. Ideally, you have a way to drill down into specific groups of people to see engagement trends within each supervisor’s team. This can give you insights into which leaders and teams are most highly engaged, giving leaders a starting point for where to go to improve their mastery at facilitating engagement. Leaders whose teams struggle can learn from leaders whose teams thrive. Beyond anecdotal experiences company leaders can share with one another, having a consistent leadership training program will give all leaders some strong fundamental knowledge and skills for facilitating employee engagement. Insight gives company leaders individualized action plans for each person on their team, complete with specific, guided actions they can take to increase engagement. This is a critical component to better engaging employees in ways that they value most. Pairing this individualized approach with a more traditional leadership training program will give leaders better context and more ideas for increasing employee engagement on their teams. It’s not enough to provide the tools and metrics for facilitating employee engagement. Leaders must also be accountable to their teams’ levels of engagement. Consider having leaders report on their engagement trends and efforts as part of your standing management meeting. This will require leaders to review and consider their engagement efforts on a regular basis. Regular reporting in a meeting will also give them opportunities to share engagement ideas with other leaders. Additionally, instituting a dedicated time for discussing employee engagement will allow leaders to ask for help from their peers if they encounter problems with employee engagement on their teams. We’ve developed the Employee Engagement Quadrant (EEQ) to identify where to focus your employee engagement efforts in your company. The EEQ helps leaders identify who is most engaged, who is least engaged, and—most importantly—who is seeking engagement. Engagement seekers are employees who value engagement factors (e.g., someone seeking more Autonomy at work) but do not see the company demonstrating those engagement factors (e.g., offering employees control over what they work on). Once you start seeing positive results from your employee engagement program, remember that there is always room for improvement. Employee engagement is a continuous effort—an ongoing relationship between a company and its employees—that requires continuous nurturing. Consider having a quarterly employee engagement review, where your employee engagement program manager can report on trends, past engagement efforts, and feedback from your team on employee engagement initiatives. Analyze what went well and what went poorly in the last quarter, and use those lessons to better plan your company’s future employee engagement efforts. Book a demo today to get started with Insight, our employee engagement platform. Insight is the first employee engagement platform to offer personalized, concrete, guided action plans for each person on your team. Leaders will see engagement ideas that positively influence engagement on an individual level, making them more effective and confident in their approach to employee engagement. What Should You Do with Disengaged Employees? Have you ever had someone on your team that seems completely unmotivated? They don’t participate in team discussions, they keep their head down, and you find yourself wondering what they think. You may even feel like they’re not thinking, or that they don’t care about their work. These people are disengaged employees, and that’s as much your fault as it is theirs. So what can you do to help? Hypothetically, no new employee should be disengaged at the start of their employment. Assuming you have adequate recruiting and hiring processes in place—and your team’s purpose is clear and compelling—your new hires are likely very engaged on Day One. They’re excited to find their place in this new world and believe they are a valuable contributor in attaining the company’s goals. Then something bad happens. Teammates are unhelpful or rude. The employee’s manager doesn’t listen to their concerns. Or the employee finds the nature of their day-to-day work to be unfulfilling. At first these may sound like external factors that the employee—or you as their team leader—are unable to control. However, through careful observation, you can identify early signs of lessened engagement. Identifying problems early can prevent your struggling employee from becoming completely disengaged. First and foremost, you can identify a disengaged employee by what they tell you. What concerns do they raise? Do they propose solutions to problems, or ask you to find a solution? Do they ask any questions at all? Silence is an indicator of disengagement. Similarly, voicing concerns without proposing solutions can be a sign of disengagement at work. There may be several reasons for a team member not speaking their mind. Perhaps they are intimidated by the people in the room, don’t want to sound ignorant or stupid in front of their peers, or need a little time to fully form their thoughts. Whatever the reason, if you’re noticing an absence of ideas from someone, they are not highly engaged. In addition to their words (or lack thereof), watch how employees behave. Do they appear isolated from others? Do they dodge groups or keep headphones on all day? Do they appear upset, frustrated, or dejected? Disengaged employees are less likely to have friends at work, to join conversations with their peers, or to even passively listen to peer groups. The most disengaged employees wake up dreading work, wishing to remain as distant and undisturbed as possible throughout their work day. There are certainly times when people need to remain undisturbed. Creatives and other knowledge workers may need significant blocks of time to themselves in order to think through problems or come up with interesting new ideas. However, if all you see is isolating behavior without a related burst of ideas or productivity, you likely have a disengaged employee. As I mentioned earlier, there are several reasons why someone may become disengaged. They may feel ignored, undervalued, sidelined, or perhaps even disliked. They may find that their personal values have diverged from those of their team. There are so many reasons to become disengaged that I simply can not list all of them here. And you won’t be able to guess why a particular person is disengaged without asking them. When measuring employee engagement, I ask team members how much they value specific engagement factors. For example, an underpaid person may value compensation most. Alternatively, a person fully committed to your team’s mission may value a sense of purpose in their work more than anything else. Once I understand what is important to a person—what engagement factors they value most—I seek to understand how they believe the company performs in those areas. For example, I might ask a person if they would refer a friend to work on our team if I want insight into their job satisfaction. Once you know what engagement factors are important to a person and how they perceive the company’s work in those areas, you can paint a clear picture of the cause behind their disengagement. If a person strongly values autonomy (self-direction) in their work but all of their tasks are prioritized and assigned by you, they will feel less engaged. Can disengaged employees become engaged? Remember my earlier assertion: if you’re recruiting and hiring well, no employee starts their job disengaged. They are highly engaged at the start. Their level of engagement changes over time as they discover more about their team—including you, their team leader—and themselves. Just as a person’s level of engagement may decrease over time, it may also increase. Recognize, however, that a change in engagement—positive or negative—is a response to something that has happened with your team member. If their raise request is rejected, they’ll feel less emotionally connected to the organization because their perception of their value does not match the organization’s perception of their value. If they receive a spot bonus for doing great work, they’ll feel appreciated and in alignment with the direction of the company. Considering that any change in engagement is caused by something that has happened to your employee, you may face a difficult choice when working with disengaged employees. Positively influencing a person’s engagement takes time. Employee engagement is an emotional connection and commitment to your company. That commitment works both ways: the employee invests time and energy in the relationship, and so does their leader. So the question becomes, for you, a leader of a team with several people who want your time and attention, where do you spend your time? Do you focus on very disengaged employees, who require considerable effort compared to more passionate engagement seekers? How do you determine whose engagement level to focus on? The answer to that question depends on your team. Do you have willing engagement seekers, who just need a little nudge to change their perspective? Or do you only have disengaged employees, who need significant time and attention to experience any meaningful change in employee engagement? Generally, if you have team members who want to be more engaged, pursue strengthening those working relationships before expending too much time on very disengaged employees. Start by making an assessment of each person’s engagement level. Insight makes this as simple as sending a survey and reviewing our Employee Engagement Quadrant (EEQ), but this is an exercise you can run manually on small teams. Identify a few key areas of things in team members’ work lives that you can influence, and then see how they feel about those areas. Use the importance/perception qualities of engagement described earlier in this article to see where people would be placed on an EEQ. Using the EEQ, you will see who to focus on first: engagement seekers, followed by satisfied employees, and finally disengaged employees. This recommended order is based on who you can most likely influence to become more highly engaged at work. What do you do when a disengaged employee feels like a lost cause? Many team leaders will feel compelled to “fix” disengaged employees. This is not the approach I recommend. Employee engagement is a two-way street—a personal relationship like any other—and as a leader you are just as responsible for disengagement as those who are disengaged. There are a number of options for how to address a disengaged employee. Your responsibility as a team leader is to choose the best option for you and your people. In an ideal world, you work with your disengaged employee to positively influence their engagement. This includes identifying the most valued engagement factors, planning actions to take with the employee to positively influence those engagement factors, and iterating on the plan as the relationship moves in the right direction. Our Insight employee engagement platform takes care of the planning for you, prioritizing concrete, guided actions you can take with a person based on what they need at work most. Since employee engagement is a human relationship, you may find that you can’t always connect with every person. Sometimes the best thing you can do for a disengaged employee is step out of the way. Ask another company leader—preferably one you know the disengaged employee respects and enjoys—to help. If another leader has a greater impact on your disengaged employee, you will have a neutral third party who can give you advice on how to better support your people. If an employee finds their work unrewarding or unfulfilling, perhaps they should be in a different role. Analyzing what they enjoy and discussing other needs and opportunities on your team may open both of your minds to ideas that meet everyone’s objectives: necessary work gets done and everyone feels better about their contributions on the team. There may not always be an engaging role for every employee on your team. When you identify a possible place an employee could move to elsewhere in the organization, discuss the opportunity with them to determine if it would change their perspective. Convey that you want the employee in the most fulfilling and appropriate position for them, even if that means moving them to another team. Perhaps the disengaged employee declines the opportunity, but the offer alone may positively influence their engagement, so long as you come from a place of compassion when suggesting a transition. While terminating an employee should be a last resort, if you have exhausted your other options, you may find that termination is the best option for everyone. Compassionately helping a disengaged employee move on can alleviate the common problems with retaining a disengaged employee, preventing a domino effect on the rest of your team’s level of engagement. Disengaged employees are sometimes perceived as not pulling their own weight, which leads to frustration from other team members. Making a sane exit plan for a disengaged employee may help them more than you realize. Giving a departing employee some leads on relevant job openings may help them land a more appropriate—and engaging—job than you could offer them in your organization. Just because a working relationship did not work out doesn’t mean you have to end on bad terms. Chances are, if you’re considering letting someone go, they are thinking of ways to get out of their situation too. Book a demo today to get started with Insight, our employee engagement platform. Insight is the first employee engagement platform to offer personalized, concrete, guided action plans for each person on your team. Leaders will discover engagement ideas that positively influence engagement on an individual level, making them more effective and confident in their approach to employee engagement. What is the Employee Engagement Quadrant? Our employee engagement platform, Insight, analyzes employee engagement based on 12 engagement factors. We use this information to provide action plans leaders can use to increase employee engagement with every single person on their team. Each team member’s action plan is catered specifically to what they care about most. This automated planning is the most valuable piece of our platform. But this individualized planning focus has one drawback: it’s easy to lose the forest for the trees. That’s where our Employee Engagement Quadrant comes in. The Employee Engagement Quadrant describes how positively team members view the company alongside how passionate they are about their own engagement. Simply put, how do employees think you’re doing, and how much do they care? At a glance, you will find how engaged—and how likely you are to better engage—every person on your team. Above is an example Employee Engagement Quadrant (EEQ). 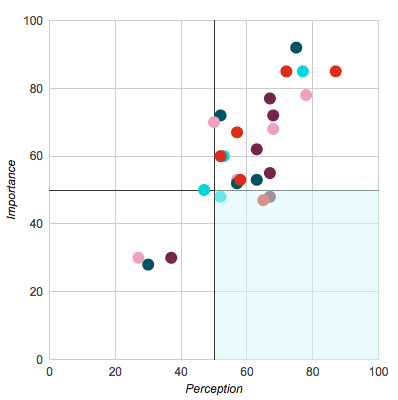 Each point on the chart represents an employee’s Importance and Perception engagement metrics. 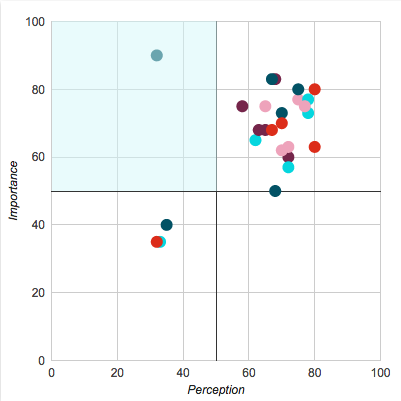 What are Importance and Perception? Importance is the significance of an engagement factor in an employee’s everyday experiences at work. 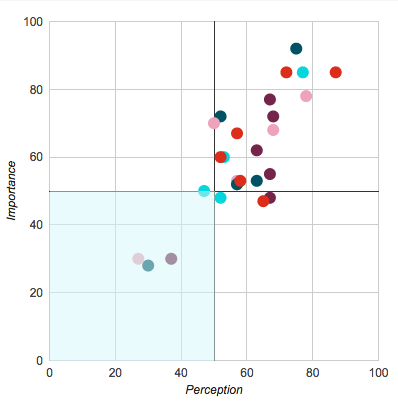 Perception is how strongly the employee perceives the company to demonstrate their commitment to an engagement factor. These two qualities are measured for each of Insight’s 12 engagement factors. The individual scores for each engagement factor are then rolled up into an overall metric that represents Importance and Perception for an employee on the EEQ. Importance of an engagement factor tells you how much an employee cares about a distinct area of engagement. Perception tells you how well the employee believes the company performs in that distinct area of engagement. What do the four quadrants mean? Our ultimate goal for any employee on your team is to increase their overall engagement with the company. Each section on the EEQ describes the relative engagement levels of team members, and how likely you are to positively influence their engagement levels. Ideally, everyone on your team is sitting in the top right quadrant. People in this quadrant are your engaged employees. These employees value what the company values. Furthermore, they believe that the company is doing a great job at facilitating employee engagement. This is your desirable end state after using Insight with your team. Don’t consider your job to be complete if your team is full of culturally aligned employees, however. There is always room to improve, and maintaining a positive, fully engaged culture is a continuous effort. People in the top left quadrant are engagement seekers. While they are not currently satisfied with the company’s demonstrated commitment to engagement, they care deeply about their own engagement levels. Engagement seekers want to be culturally aligned employees. Better engaging people in this quadrant will lead to the most positive results in your team’s overall engagement score. That is, you should spend significant time and energy with engagement seekers, because they are willing and ready to become more engaged at work. The EEQ’s bottom left quadrant is where you will find disengaged employees. As a leader, this is a perfect storm of disappointment. Disengaged employees generally believe the company is not performing well and do not feel strongly motivated to seek improvements. Unfortunately, this quadrant often leads to difficult decisions for leaders. Do you invest your time in these people? Or do you compassionately encourage them to seek a better fit elsewhere on another team or in another company? The answers to these questions depend upon your willingness to commit significant time and energy into positively influencing these team members. You will find satisfied employees in the bottom right quadrant. While these people believe the company does a great job at facilitating employee engagement, they may not feel very passionately about engagement efforts. The reason for this apparent satisfaction but lessened passion may simply be because your company is doing well. While your investment in better engaging these employees may pay off, you will have an easier time influencing the engagement seekers in the top left quadrant. Where should I start with an Employee Engagement Quadrant? Once you find your engagement seekers in your top left quadrant, review their action plans. Insight automatically generates prioritized action plans based on what each employee needs most to increase their employee engagement level. By following an engagement seeker’s action plan, you will help them become a culturally aligned employee: someone fully engaged and greatly appreciative of the work environment you helped create. Recently we’ve covered 12 myths about employee engagement and how often you should conduct employee engagement surveys. But what is employee engagement? Employee engagement is the strength of an employee’s emotional connection and level of commitment to their organization. Notice that our definition describes a level of engagement, not a black-and-white end goal. An employee may be highly engaged, barely engaged, or somewhere in between. It’s more important to positively influence your company’s engagement trends than to focus on reaching a specific level of engagement. How do you demonstrate employee engagement? To understand an employee’s emotional engagement with the company, look to their behaviors in the workplace. Do they speak positively about the company’s goals, performance, and leadership? Are they encouraging their friends and peers to come work with them? Most importantly, are they working in alignment with company goals? Highly engaged employees are more likely to step outside of preconceived job descriptions and contribute however they can to helping the company meet its goals. What are some examples of employee engagement? Highly engaged employees may do anything from the mundane to the extraordinary in an attempt to help the company meet its goals. They may clean up kitchen or lounge areas so others have a tidy place to take a break. When they see a need on their team, they may introduce a new tool to help out. If communication breaks down somewhere on the team, they may even propose a new process that prevents similar communication issues in the future. Additionally, highly engaged employees will likely ask more questions. When tasked with something new, they may ask what the goal of the task is, or ask what defines success for completing the task. Engaged employees ask questions to understand how their work aligns with company goals. Understanding goals and objectives helps them do their best work. Engaged employees will also be more likely to voice concerns, propose alternatives, or bring up new ideas that they believe can help the company. This doesn’t necessarily mean they have great ideas: a poor-performing employee can be highly engaged. High-engagement behaviors demonstrate that a person believes in the company, not that they know what is best. However, highly engaged employees will be receptive to feedback that helps them improve their performance. Small organizations rarely explicitly mention employee engagement. It is simply part of being a small, connected team. Company leaders will trust their gut on who is engaged and how to increase engagement. This is because very small teams are more likely to have a strong emotional connection to each other and their work. There are less layers of people to communicate ideas from the top of the organization to the bottom and vice-versa. Small teams therefore are more likely to be aligned toward company goals, making explicit measurement of employee engagement less important to very small teams. However, once you begin introducing layers of management, larger project teams, and a higher overall company headcount, quantifying engagement becomes more important. It’s difficult for any one person in a large organization to understand or influence engagement across dozens or hundreds of employees. This is where employee engagement surveys come into play. Surveys give you a framework for measuring engagement factors such as job satisfaction, confidence in leadership, autonomy, mastery, and purpose. Once your employees respond to an employee engagement survey, you can identify trends and outliers across departments. Survey reporting should give you a concrete measurement of how engaged individuals are, relative to the average person in the company. If you are interested in learning more about different types of employee surveys, read our article about how often you should conduct employee engagement surveys. Once you have consistent measurements in place, you need to identify two things for each person. 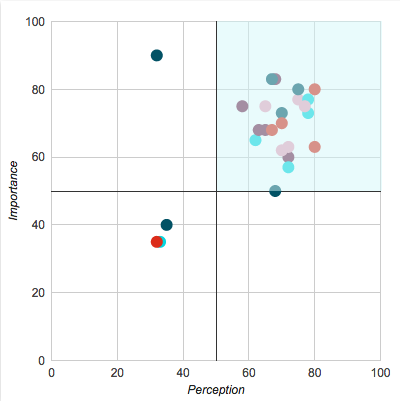 First, which engagement factors do they perceive the company to perform worst at? Second, which engagement factors do they value the most? When you are able to identify these two indicators of engagement, you can begin influencing the things they care about most. Notice the words used here, though: perception and value. Despite how you personally feel about the company’s performance on engagement factors, your employees may feel differently. This is not a judgement on the company or the survey respondent. Instead, engagement surveys give you insight into why people are engaged or disengaged at work. Once you understand what motivates or demotivates a person in their work, you can build an action plan to address their perceptions and values. For example, if Anne values autonomy and believes the company does not provide much autonomy, she will likely feel disengaged at work. To increase her engagement, you can offer more autonomy: delegate important objectives to Anne. Instead of specifying concrete tasks that must be completed to reach an objective, instead start with the objective. Define metrics for success (e.g., “help the assembly line produce 100 more widgets per day”), and leave it up to Anne to determine how to make it happen. This is one of countless examples of actions a supervisor can take to increase an individual employee’s engagement. Our employee engagement platform, Insight, automatically builds a recommend plan of action for each person on your team. These actions, derived from employee engagement ideas in our playbook, are chosen based on the individual’s most impactful engagement factors—those which are most valued but perceived to have room for improvement. Are you ready to improve employee engagement on your team? Try out Insight, our employee engagement platform. It’s the first employee engagement platform to offer personalized, concrete, guided action plans for each person on your team. Leaders will see engagement ideas that positively influence engagement on an individual level, making them more effective and confident in their approach to employee engagement. How Often Should You Survey Your Team? There are several types of internal surveys companies use to measure different aspects of their teams. When you survey your team, you need to have a specific goal in mind for the completion of the survey. What information do you hope to glean from respondents, and what do you intend to do with that information? If you survey your team, your team members are going to expect a response of some sort. So before you hit that “send survey” button, consider what comes next. Choose a survey method and questions based on what information you want. Then determine how you intend to respond to survey feedback. And finally, plan the timeliness of your response. These decisions dictate how often you should survey your team. First and foremost, before determining when to survey your team, you need to identify your survey goal. There are many types of employee surveys, and your goal will influence which survey type you choose. Cultural surveys help company leadership identify the shared values and beliefs of people in your organization. Use this type of survey to find which aspects of working relationships people care about most. You can then distill this information into company-promoted beliefs and values. This research is useful when designing a framework employees can use to make sound decisions in their everyday work. For a concrete example of such a framework, review Netflix’s culture and its nine values. Employee engagement surveys are designed to measure team members’ level of engagement. There are countless definitions for employee engagement online. Our definition for engagement is the strength of one’s emotional connection and level of commitment to their organization. In fewer words, engagement measures how much your employees care about your company. There are a few reasons to survey your team’s engagement level. You can use engagement survey results to identify how team members perceive company leadership. Results can also orient you toward areas of need in the organization, likelihood of employee attrition, or even insight into how clear your mission and values are shared throughout the organization. Job satisfaction surveys are a bit narrower in focus. You’re not necessarily asking employees about how committed they are to your company and its mission. Instead, you’re asking people how they feel about their job. For example, job satisfaction surveys can give you insight into issues with shared workplaces (“it’s too loud in the break room!”), working conditions, needed resources, or other quality-of-life issues people encounter at work. Similarly, pulse surveys give you a quick way to measure employee satisfaction. Ranging from one to five questions, these surveys give you less detail but more regular insight into how your team feels. Different types of surveys are useful on different time scales. While you need to find what works best for you and your team, here are some common survey cadences and the rationale behind them. Cultural surveys are most useful when the makeup of your team significantly changes. This may be an annual exercise at best for stable teams, possibly something you only do every few years. Conversely, if you are in growth mode and adding dozens or hundreds of people to your team in a shorter amount of time, you should survey your team more frequently to identify your team’s cultural values. During high growth phases, you may find it helpful to send a cultural survey every quarter. This frequency is not necessarily intended to reshape your culture every three months. Instead, it’s to ensure you understand what your new people value and how their values may shift as the team grows. Engagement surveys may be conducted on a quarterly, semi-annual, or annual basis. My personal opinion is that employee engagement should be measured quarterly. However, that comes with a big caveat I’ll discuss more in a moment: surveys will only remain effective so long as you respond to them in a timely and productive manner. Similarly, job satisfaction surveys require a considerate response, and your ability to form an effective response will influence how frequently you survey your team. Ideally, you are measuring job satisfaction at least quarterly, assuming you can maintain that quick of a feedback loop. Pulse surveys are typically performed weekly. They’re short, simple, and intended to give an approximate feel of how your team is doing right now. To elaborate on my earlier point, you should only survey as frequently as you can respond to survey feedback. If you can only work on addressing team concerns on an annual basis, well, you should only conduct an annual survey. Are you able to respond effective to quarterly surveys? Fantastic, do quarterly surveys. If you can’t respond adequately to survey feedback, your team will begin devaluing the survey process. Should your team stop believing you will do anything with their responses, they will stop responding. Even if you require responses from each person on your team, they will put less thought into their responses if they believe you won’t do anything with their responses. Forming an adequate response is therefore necessary to maintain high team participation in surveys. When you consistently demonstrate to your team that you take their concerns seriously and are willing to act on them, you are building trust. Your employees will gladly take the time to fill out Yet Another Survey (TM) if they believe you will act on their feedback to improve things for them. What Is a Leader’s “Response” to Survey Feedback? Your response is a combination of the actions you take to address feedback and the message you provide to your people about those actions. While you may feel like taking actions based on employee feedback is the end of this process, it isn’t. You need to ensure that your team understands what actions have been taken. Otherwise, your good work to improve their work lives may go unnoticed, even if the change is apparent to you. Additionally, once you have taken action and communicated them to your team, you should ask for more feedback. Follow up with the team to see how they feel about the changes you’ve implemented, even if you believe the changes to be inherently positive and clearly appreciated. This will signal to the team that—even after you have solicited and responded to feedback—you want a continuous feedback loop that continually adjusts to the needs of the team. Again, this approach will reinforce the idea that you care about what your team cares about. The feedback loop encourages people to respond to future surveys and give you even more great ideas for improving your company. Identify the actions that should be taken based on employee survey responses. Outline these actions in concrete steps as part of an action plan. The action plan should include the action, desired outcome (positive impact of the action), and requirements to perform the action. Additionally, you should assign each action to a specific person to undertake. This task assignment gives other team members an opportunity to be involved in enacting positive changes, increasing their level of engagement with the company. Everyone feels accomplished after doing things that have a clear benefit to their team. Finally, set timelines your action-takers can commit to for completing their tasks. This accountability to a schedule encourages people to move quickly, shortening your survey feedback loop. Once you’ve gone through this survey-and-respond feedback loop a few times, you’ll identify how quickly you can iterate on the team’s feedback. Use this to establish a set schedule people can rely on. If you’re able to offer an employee engagement survey every quarter and respond effectively to the employee concerns, put it on the calendar. Consistency helps people know what to expect and gives you a social obligation to produce a new survey on a regular basis. There are many myths and half-truths about employee engagement. This article covers 12 common myths about employee engagement. We identify what engagement is actually about and how you can influence engagement in your team, either as an individual contributor or as a leader of people. I define employee engagement as the strength of one’s emotional connection and level of commitment to their organization. Having an emotional connection to your company means believing in its purpose. How hard you work to achieve that mission is your level of commitment. A highly engaged employee believes in their work and strives to help the company achieve its goals. Here are our top 12 myths about employee engagement. Avoid these misconceptions to better facilitate engagement on your own team. It’s easy to blame people for not being engaged with your company. However, there are several reasons why a good employee may feel disengaged at work. Are they in the right role with the right responsibilities? Do they understand the company mission and vision? What is their motivation for doing a good job? I once had a team member who wanted to do great work but didn’t believe their job was important. Once I framed the significance of their work within the company’s goals and outlined specifically how their work contributed to meeting our goals, they began investing much more energy in their work. They paid more attention to detail, increased the quality of their work, and regularly asked more questions to ensure they were on the right track both in their work and in their attitude toward our mission. This team member wasn’t a bad employee. They had a poor perception of the value they were bringing. They believed in the company mission—it resonated with them as something meaningful—but didn’t see the connection to their day-to-day work. Once they found that connection, everything turned around. When you believe you have the right person on your team but their performance is poor, you may believe you’ve placed the person in the wrong job. While this is a possibility, there are other reasons that may be behind poor performance. Before you dismiss their fitness for a job, ask yourself if they have what they need to do a good job. Have you or other team members demonstrated your support for the this person’s work? Do they have the tools and resources they need to do a good job? Employee happiness or job satisfaction are concepts often conflated with employee engagement. However, it’s absolutely possible to be completely happy with your job and completely disengaged from your company. People can be happy with their coworkers, their day-to-day tasks, their compensation, and so on, but not care much about the company’s higher level goals. Some may even feel safer not sticking their head up and forming a stronger connection to the company. Why commit to more work to meet company goals when you’re doing perfectly fine for yourself by keeping a low profile? Some people that fit this profile may not care much about the company mission while deeply enjoying their work experience. Conversely, you may find unsatisfied employees who are highly engaged with your company. In the past, I have fallen neatly into this category. I believed in what the company was building, but was never pleased with what had been done. I felt like there was always more to do and that I had not done enough to attain our mission. This is a bit of an extreme example of intrinsic motivation. I had a strong internal sense of purpose, emotional connection to my employer, and a strong commitment to my work. However, I held such a strong connection to our mission that I never felt like I had done enough. Thus, I had low job satisfaction but high engagement. I wanted to build great things, but I let the desire to do so override any sense of accomplishment. While excellent job performance can be an indicator of engagement, the two concepts are not the same. Just as you can be very satisfied and disengaged, you can also be a great worker and disengaged. This can be a frightening combination at scale: if your high performers are not highly engaged, they may be at risk of leaving your company. And if they’re high performers, they likely have high employment mobility, meaning some better opportunity will find them eventually. When that time comes, you’ll wish your top performers were highly engaged. A strong emotional connection and commitment to your company, in most cases, can be enough to deter them from competing offers. So how do you know if a high performer is highly engaged? Examine why you believe them to be high performers. Are they producing high-quality work only within their defined job role, or are they reaching out beyond that role? Do they strive to improve their team, or even the entire company? Have they referred their friends and industry peers to work for the company? Do they promote the company mission and vision to others? If so, you have a highly engaged employee on your hands. If you believe your high performers are not highly engaged, not all is lost. You can facilitate their engagement through things they value. Personal recognition, compensation, increased autonomy, new responsibilities, and other acknowledgements of their great work can help increase their level of engagement. Some managers believe employees are solely responsible for their own engagement. However, engagement is a two-way street. Just like any relationship, you need participation from both sides—in this case, the employee and the manager representing the company—in order to have a great relationship. Putting the onus on employees is a bit lazy. As a leader, you must reflect on your contributions (or lack thereof) in facilitating employee engagement. Or put more simply, if you want an engaged team, you yourself must be engaged. Speaking of engaged leaders, not all leaders are automatically engaged with the company. Your level of engagement will fluctuate over time, so it’s entirely possible a once-highly-engaged leader no longer feels the connection they once did. With leadership promotions come responsibilities that are neither enjoyable nor avoidable. Leaders are more likely to hear negative news—problems, deficiencies, and gaps that need to be filled—than they are to hear positive news. After all, leaders help guide teams when they need it, and most people don’t ask for help when things are going well. Additionally, leaders are less likely to receive praise than individual contributors. It’s uncommon for employees to thank their boss for doing a great job with corrective action. Or intervening in something they believe they could have handled themselves. Or declining a raise request. These things are difficult for leaders and can eventually wear them down. As mentioned earlier, engagement is a two-way street. One way to combat disengagement in leadership is to lean on individual contributors who recognize why leaders do what they do. “Great micromanagement, boss!” is a phrase you’ll probably never hear. But employees can commend leaders on offering guidance in difficult situations, asking questions that re-frame problems, and regularly reminding everyone how their work contributes to the company’s greater purpose. It’s often said that company culture can’t come from the top down. While this is true in one sense, it’s false in another. Certainly, every person on your team influences the culture that exists in your company. However, the actions and attitudes of company leadership demonstrate what is expected of people and what is acceptable. A leader who complains to his direct reports can expect that his direct reports will complain to their subordinates as well. A leader who praises his team and builds them up when they need help can expect team members to do the same. Therefore, don’t wash your hands of attempts to improve culture or increase engagement just because you have a fancy title. Recognize that you are a representative for the company and that your words and actions indicate what the company truly values. This demonstrative leadership will send signals to your team, indicating what you value and what you want them to value. You absolutely drive team engagement, whether you realize it or not. Building a great company culture is no accident. Neither is a high level of engagement. Both are the result of a disciplined leadership team consistently promoting their desired behaviors and attitudes. The key word is discipline. Company culture and employee engagement are not natural outcomes of a one-and-done attempt to make things better. Leaders are responsible for regularly engaging team members. This is why so many companies have weekly all-hands meetings. It’s an opportunity for company leadership to reset expectations, share what good and bad things are happening across the company, and lay out a vision for the future. Group settings like all-hands meetings are great for explaining the direction you want for the company. However, it must be supplemented with one-on-one interactions as well. Individually meeting with every direct report—formally or informally, it doesn’t matter—at least weekly is a good first step. Ideally, you are in continuous conversation with your closest team members. This is not only so you can reinforce the company vision. It’s also so you can hear about small issues before they become big problems. A constant, open dialog with team members gives you an opportunity to identify and fix problems quickly. This action reinforces the notion that you (the company) care about them (the individual team member) and want them to have a great place to work. There are countless employee engagement suites available in the marketplace. There’s also an army of business coaches, leadership coaches, executive coaches, team engagement exercise leaders, and other funky-titled contractors willing to give you peace of mind for a bit of cash. However, all of these resources are just a part of the picture. They can be a guiding light that can bolster your engagement efforts, but they can not replace the day-to-day work of your company leadership. It’s important to have the right education, tools, processes, and support in place to facilitate high levels of employee engagement. However, those things are not enough. Remember, employee engagement is an emotional connection and commitment to your organization. You can’t buy your way into an emotional connection. You have to work at building that rapport with each individual team member, every single day. Another common misconception is that “great place to work” or “best employer” awards are won by highly engaged teams. While there may be some strong correlation there, companies with high employee satisfaction are the most likely to win these awards. Certainly, highly engaged teams tend to be more satisfied. However, engagement and satisfaction are separate objectives that are driven by separate types of action. There are immense benefits to having high engagement, though, even if it doesn’t guarantee your company will win prestigious awards. Highly engaged teams are more likely to hit company goals and objectives, retain team members, and attract top talent. So while you may not be standing on stage giving an acceptance speech any time soon, your highly engaged team will be winning at things that matter more to your company’s purpose. An employee’s level of engagement is a moment in time. Engagement levels go up and down depending on the team member’s interaction with others, ability to meet goals and objectives, and several other motivating factors. Today’s highly engaged employee may be tomorrow’s resignation letter. It is therefore important to continuously monitor employee engagement. Identify when someone’s level of engagement drops so you can respond appropriately and get them back to a happy place. You can monitor engagement through engagement software such as Pulse or through personal interactions and observations. Everyone has an off day now and then, but if you recognize someone struggling to stay motivated for several days or weeks, you may be witnessing a drop-off in engagement. As mentioned earlier, there are many tools and resources available to help you increase employee engagement: software, coaches, books, and so on. At first glance, these investments may feel like unnecessary costs that you will not recoup. Many HR teams who initiate employee engagement programs can face challenges justifying these expenses. However, high levels of employee engagement actually save the company money in the long term. Highly engaged teams are less likely to experience significant turnover. This alone brings savings that justify the time and money investment into facilitating employee engagement. Additionally, high engagement can be used as a recruiting marketing tool, reducing the cost to recruit and hire new employees. In addition to the costs associated with addressing employee attrition, long-term employee retention and development can give your company new opportunities. Highly engaged teams are more likely to promote from within, giving you a competitive advantage when it comes time to fill new leadership positions in high-demand and low-supply talent pools. Now that you understand the truth behind the myths about employee engagement, are you ready to improve engagement on your team? Start by measuring the current levels of employee engagement, identifying areas for improvement, and tailoring your interactions with each team member based on what they care about most. Insight is our employee engagement platform, and it will help you do exactly that. It gives you individualized, guided action plans to facilitate engagement with every single team member.